SUBHEAD: At Standing Rock indigenous protectors and demonstrators find a sense of purpose. Image above: Protesters march from a camp to a sacred burial ground at the Standing Rock Sioux Reservation in North Dakota, September 9, 2016. Photo by Alyssa Schukar for The New York Times. From original article. Drive from Bismarck, North Dakota, to the Standing Rock encampment, and the sign that something unusual is happening is abrupt: a checkpoint staffed by the National Guard. Continue south, past rolling grasslands with an occasional farmhouse, until there is nothing but open space. Catch a glimpse of the Missouri River meandering back and forth, and a flock of white pelicans circling overhead. Miles later, by the side of the road, stands a small encampment -- tents, a camp kitchen, a group of people watching the road warily, banners declaring water, not oil, as sacred. Across the road is the bulldozed earth in an area that Standing Rock Sioux consider sacred. This is where the security forces with dogs attacked the people who call themselves water protectors. The impact is powerful. So many people have traveled hundreds or thousands of miles to make this pilgrimage. When people first meet, they ask each other where they're from. Some are old friends, but many represent tribes that have been estranged or enemies for generations. Many spoke of the arrival of representatives of the Crow Nation, who have a long history of supporting coal mining and working at odds with other tribes. They too came to support Standing Rock. The purposefulness here overcomes everything -- the determination that this time the damage will be stopped. This time, before the water is poisoned or another sacred site is bulldozed, the protectors will step in. I had arrived with Sweetwater Naanuck and her friend Kim Morera, pulling a horse trailer, and as we set up our tents, a young man on horseback came by to check on us. Later, a small all-terrain vehicle pulled up with jugs of water for the horse and the campers. Others stopped to offer donated kitchen supplies, food, and a garbage pickup. Naanuck set out to find people to complete the banners for the Northwest tribes' "Paddle to Standing Rock," and soon returned with a crew of young people. Life at the water protectors' encampment is much like life was for millions of years of human evolution -- close to the earth, near a river, clustered in family and community camps. There's a rightness to these connections and to the feeling that people here will help you when you need it. Here, with a purpose that threads through generations, work, celebration, and activism are a seamless whole. Young people ride through the camp on horseback among tents and teepees. Are they providing security, learning traditional animal caretaking, or just having fun together? Elders tell stories of Wounded Knee, say prayers, and sing. Are they educating the next generation, building coherence, or guiding the actions? These things are not separate. They are all of a piece, all about rebuilding indigenous ways of life and standing against further destruction. People come and go. Some depart after a few days or weeks, but their reluctance to leave shows. Others are making plans to live in wood-heated tents and teepees through North Dakota's bitter cold winter. SUBHEAD: Keep It In The Ground supporters arrested after delivering petitions calling for end to US fossil fuel leases. Image above: Indigenous women protest at the White House on Friday, September 15, 2016 against federal leases on public land for fossil fuel extraction. (Photo by Valerie Love. From original article. Marking year of action, climate campaign delivers petitions, occupies Interior Department to call for end to fossil fuel leases. Forty arrested. Keep It In The Ground say it is a gesture of solidarity with the Standing Rock Sioux in their resistance to the Dakota Access Pipeline. Climate activists from around the country who collectively make up the massive Keep It In The Ground movement delivered more than one million signatures to the White House on Thursday calling for an end to fossil fuel use. 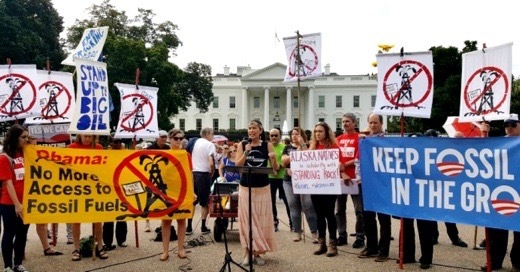 The event marked the one-year anniversary for the Keep It In The Ground movement, which began with a call from more than 450 nonprofit groups and organizers for President Barack Obama to take action on fossil fulels and stand up to Big Oil. "We have come from across the country to deliver a powerful message to President Obama's doorstep—enough is enough. It is time to change our relationship with fossil fuels as a country, which means no new leases and no new pipelines, period," said Diana Best, Greenpeace senior climate and energy campaigner. The action also comes as people contend with climate crises around the country, such as the recent historic flooding in Louisiana—where recovery efforts are still ongoing—and the continuing Native American resistance to the Dakota Access pipeline (DAPL). Many of the activists at Thursday's event were Indigenous and frontline community members. "We are getting repeated wake up calls and yet we stay asleep. The time is now—this moment—to end federal leasing of our natural resources and keep this oil where it belongs: beneath the ground," said Anne Rolfes, founding director of the Louisiana Bucket Brigade. 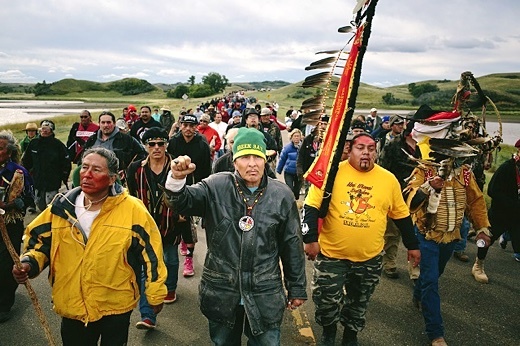 The people have spoken—we are rising for climate justice, and we are calling for President Obama to end all new fossil fuel leases on public lands and waters, and immediately terminate plans to build the Dakota Access Pipeline." In light of the landmark Paris climate agreement, which the U.S. formally signed during the Group of 20 (G20) summit in China this month, the activists say there is no more time to waste in implementing the changes needed to keep global temperature rise below 1.5°C. They also challenged Obama administration to step up its climate leadership after it moved fossil fuel lease auctions online to avoid being confronted by environmental activists. "Climate change is here," said Lindsey Allen, executive director of the Rainforest Action Network. "We're seeing record floods in the Gulf, wildfires in the west, with frontline communities bearing the brunt of this. We need real climate leadership now—not tomorrow, not in the next administration, but today." Continuing to auction fossil fuel leases on public lands and waters and pushing for the construction of the Dakota Access Pipeline "defies logic," Allen said. "[T]hey fly in the face of the newly signed Paris agreement and all the other positive things the president likes to say. It's time for him to act." More than 40 Indigenous activists, Gulf Coast residents, and other climate leaders have reportedly occupied the U.S. Department of the Interior, demanding no new fossil fuel leases on public lands and waters. Several arrests have also been reported. The protesters entered the lobby of the department chanting, "Keep it in the ground!" The Center for Biological Diversity, an environmental group that is taking part in the events, said the action represented an escalation of the Keep It In The Ground campaign and continues the message of a demonstration last month in which four people were arrested while protesting fossil fuel lease sales in the Gulf of Mexico. It is also a gesture of solidarity with the Standing Rock Sioux in their resistance to the Dakota Access Pipeline. The actions are being updated on Twitter with the hashtag #KeepItInTheGround.